Manufacturer: iWave Systems Technologies Pvt. 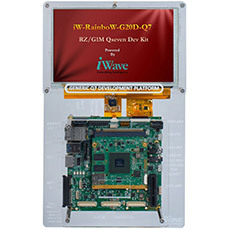 Ltd.
iWave’s RZ/G1M development board incorporates RZ/G1M Qseven SOM Which is based on Renesas high performance RZ/G1M Dual ARM Cortex A 15MPU and the carrier board with optional 7” capacitive display kit. The development board can be used for quick prototyping of various applications targeted by the RZ/G1M processor. With the 120mm x120mm Nano ITX size, the kit is highly packed with all the necessary on-board connectors to validate the RZ/G1M MPU features.